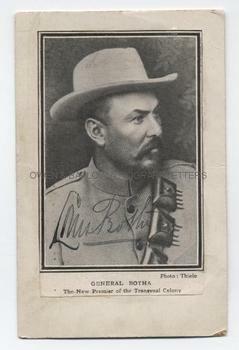 LOUIS BOTHA Newsprint Portrait Signed. South African soldier, Boer General and Prime Minister of the Union of South Africa. Newsprint photographic portrait with bold Autograph signature across light part of the image. Mounted on a post-card, which is addressed on the verso to W.H. Richardson, 77 High Street, Redcar. Approx 5.5 x 3.5 inches.Fine. General Louis Botha fought with distinction in the Second Boer War and was in command at the battles of Colenso and Spioen Cop and was the man who captured Winston CHURCHILL. After the fall of Pretoria, Louis Botha fought on, mounting a series of guerrilla attacks on British positions. This won him the admiration of the British press and public. He represented his country in the peace negotiations of 1902 and, following the grant of self-government to the Transvaal in 1907, he was called upon to form a government, becoming Prime Minister. When the Union of South Africa was created with Dominion status in 1910, Botha became its first Prime Minister.